Michael Amouri--founder and owner of Caffe Amouri--discusses running a small business, keeping priorities, and his ethos “Quality. Community. Sustainability." 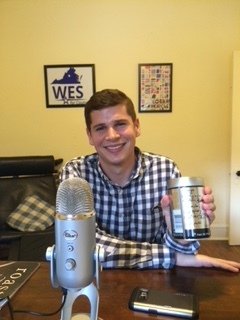 Founder of Gregorys Coffee Greg Zamfotis and I discuss his coffee journey, company logo, and bringing an established brand to a new city. Head Roaster Javier Madrano and Future Manager (17th & G Street) Tudor Payson hunker down in the Swings Coffee Alexandria Roastery to explore the history of DC's oldest roaster and discuss reopening a classic location. Jesse Breaux (yes, it is pronounced “bro”) kicks off our ‘DIY DC Coffee’ series with everything you need to know to become a master home-roaster. He is also offering a free pound of coffee to Drip listeners--tune in to learn more! Sweet Marias is also a great place to buy green beans and find roasting advice. Building community takes work, compassion, and time. Ebenezers Coffeehouse has been intentionally building community since 2006 in DC and abroad. General Manager Heather Corsi and I run the gamut of coffee talk as it relates to the Coffeehouse and its community.